When a great storyteller starts speaking, people pay attention. But with many customers hopping between channels to research before they buy, ensuring consistent messages can be a challenge. HSN uses analytics to gain insight into customer preferences around content, products and channels—helping it connect the best stories with the right audience. Masterful storytelling can turn interested viewers into committed customers—but if your message isn’t relevant and consistent, people switch off. 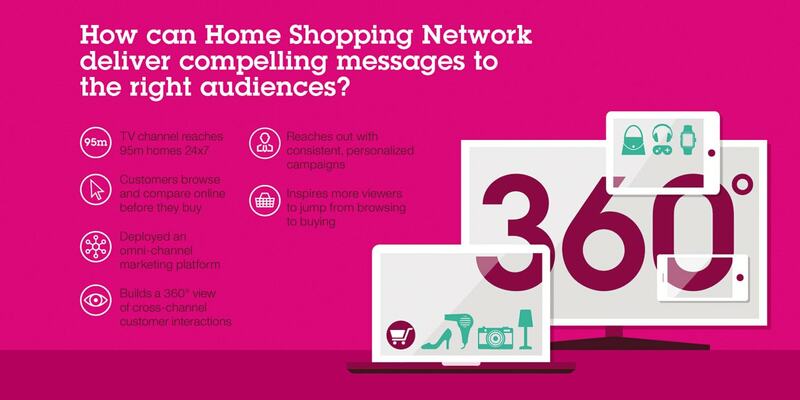 How could HSN inspire customers on every channel? HSN uses analytics to identify individual customer preferences and retail journeys, helping it to deliver compelling, tailored and timely messages at every touchpoint. To drive sales in the competitive retail space, having a great product is only part of the recipe for success. Inspiring people to make the jump from browsing to buying increasingly depends on connecting on an emotional level—and great storytellers can be the key to transforming casual viewers into loyal customers. Like many leading retailers, HSN previously relied on separate processes and systems to drive its marketing strategy for each channel. However, this approach made it complex and time-consuming to integrate data on customer interactions across different channels. As a result, it was difficult to answer questions such as: “Which of our products are most likely to appeal to this customer?”, “Which is the best channel to reach this customer on?”, and: “What kind of message is most likely to inspire this customer to purchase?”. To achieve its boundaryless retail goal, HSN created a cognitive marketing platform integrated across all its channels—including online, mobile, email and direct mail. The new approach enables the company to build up a more complete and accurate picture of individual customer preferences based on all their interactions with HSN. Michelle Voorhies, Director, Omni-Channel Marketing Strat at HSN, continues: “We have created a cross-channel view of our customers supported by highly efficient omni-channel marketing processes. This approach means that we can look closely at the journeys that customers take from becoming interested in a product to making the decision to purchase. “Because we can now see the ways that customers move between channels throughout their journey, we can empower our marketing teams to craft omni-channel, multi-wave campaigns that reach those customers on their favored touchpoint at the right time. By embracing omni-channel marketing, HSN can more effortlessly find the right audiences for its best storytellers—making it easier than ever to inspire viewers to engage, browse and convert. As HSN engages with thousands of customers every day, automation helps the company to maintain manageable marketing workloads. Founded in 1981 and headquartered in St. Petersburg, Florida, HSN is a leading interactive multichannel retailer offering a curated assortment of exclusive products combined with top brand names. Today, the HSN television channel reaches 95 million homes 24 hours a day, seven days a week, 364 days a year, and features more than 50,000 product videos through its hsn.com website. View more client stories or learn more about Watson Customer Experience Analytics. © Copyright IBM Corporation 2019. 1 New Orchard Road, Armonk, New York 10504-1722 United States. Produced in the United States of America, January 2019. IBM, the IBM logo, ibm.com, and IBM Watson are trademarks of International Business Machines Corp., registered in many jurisdictions worldwide. Other product and service names might be trademarks of IBM or other companies. A current list of IBM trademarks is available on the web at “Copyright and trademark information” at ibm.com/legal/copytrade.shtml. This document is current as of the initial date of publication and may be changed by IBM at any time. Not all offerings are available in every country in which IBM operates. THE INFORMATION IN THIS DOCUMENT IS PROVIDED “AS IS” WITHOUT ANY WARRANTY, EXPRESS OR IMPLIED, INCLUDING WITHOUT ANY WARRANTIES OF MERCHANTABILITY, FITNESS FOR A PARTICULAR PURPOSE AND ANY WARRANTY OR CONDITION OF NON-INFRINGEMENT. IBM products are warranted according to the terms and conditions of the agreements under which they are provided.